For New Customers we offer FREE floor cleaning services which include but are not limited to tile buffing, carpet shampooing, and high traffic stain removing. 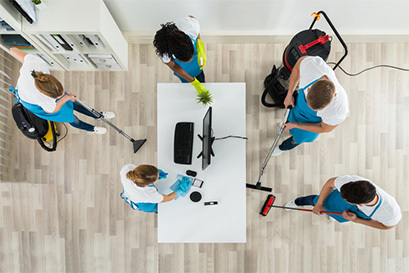 Schedule a meeting with us to see how we can improve the cleanliness of your office at no charge! For new customers, we offer FREE Floor Care which includes detailed buffing and heavy traffic areas carpet shampooing. Showcase our newest technology in performance evaluation, QR codes in restrooms. We have over 20 years of experience with cleaning construction sites, food processing plants, and other safety focused companies. Walk into a cleaner office tomorrow!